Mary, Mary, Jesus healed you. Mourned your Savior at the cross. Your Lord's body to anoint. By the grave you stood and wept. "Mary, Mary, why the weeping?" "Sir, where did they lay my Lord?" "Ah Mary, do not hold me. That I live, as they will see." "I have seen my Lord. He lives." Yesterday was the feast of Mary Magdalene. There is no evidence in any of the four Gospels that Mary was a harlot. The whole story of Mary as a prostitute, who is fallen and redeemed, is a very powerful image of redemption a signal that no matter how low one has fallen, one can be redeemed. 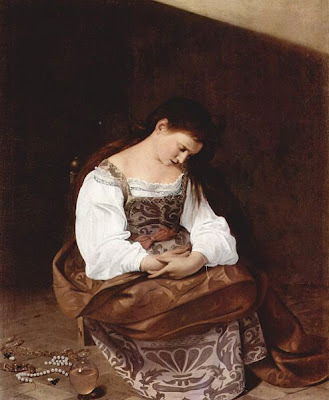 Powerful as this image may be, it is not the story of Mary Magdalene. Mary Magdalene is mentioned in each of the four gospels in the New Testament, but not once does it mention that she was a prostitute or a sinner. At some point Mary Magdalene became confused with two other women in the Bible: Mary, the sister of Martha, and the unnamed sinner from Luke's gospel (7:36-50) both of whom wash Jesus' feet with their hair. In the 6th Century, Pope Gregory the Great made this assumption official by declaring in a sermon that these three characters were actually the same person: Mary Magdalene, repentant saint. The Catholic Church did later declare that Mary Magdalene was not the penitent sinner, but this was not until 1969. After so long the reputation still lingers. Indeed! Although Caravaggio's painting of the penitent Mary contradicts the information above, I chose it because I love his art. Huh, I assumed the fact of her being a former prostitute was well established. Never occurred to me to look that up. You learn something every day! Thanks for the poem! Mary Magdalene needs all the positive art she can get to counterbalance the "bad" reputation the church gave her over the years. A few years ago I was surprised and pleaaed to discover a 1746 hymn text on Mary Magdalene by Charles Wesley that did not include all the usual "fallen woman" claptrap, but only focused on her role as Apostle to the apostles. C.W.S., thanks. You chose the same painting. The lyrics of the hymn are lovely. One might think I'd plagiarized a bit, but I've never before seen the words. Of course, we both took off from the Gospel, but Wesley is a much better poet. Mary of Magdala, Holy Apostle to the Apostles, pray for us. JCF, thank you. I post my poetic efforts in fear and trembling. Yesterday, after I posted on the feast day of MM, the poem started to form. I wrote some, left it overnight, and polished it up a bit this morning. And here it is, out in the ether, such as it is. And very nice it is, too. One would like to hear it set to music as well. Thank you, Russ. Ah, set to music. That's an interesting thought.